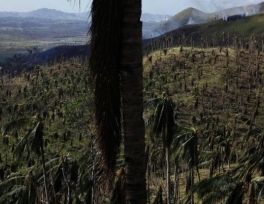 The typhoon that hit the Philippines has caused crop losses worth $110 million and inflicted damage to the agriculture sector of more than twice that figure, preliminary estimates from the United Nation's food agency showed on Tuesday. Some 153,495 hectares (ha) of rice paddy, maize and other high value crops such as coconut, banana, cassava, mango and vegetables have been hit by Typhoon Haiyan, which killed at least 3,900 people when it struck on Nov. 8. 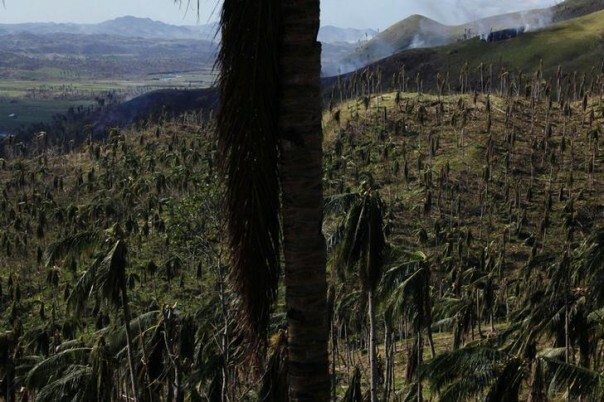 "High winds, heavy rains and localized floods destroyed houses and infrastructure, including irrigation facilities, and resulted in losses of the main staple rice paddy, sugarcane and coconut crops, as well as livestock, poultry and fisheries," the Food and Agriculture Organisation (FAO) said in a statement. The forecast for damaged areas included some 77,476 ha of rice crops and 20,951 ha of maize crops, it added. The FAO also said that imports of rice are expected to increase by 20 percent next year to 1.2 million tonnes. Earlier on Tuesday the Philippines' National Food Authority (NFA) said it will import up to 500,000 tonnes of rice from its neighbouring countries, possibly before the end of the year, as it replenishes stocks that have been depleted by the ongoing typhoon relief efforts. Because of Haiyan and another typhoon which hit northern parts of the Philippines in October, the FAO cut its 2013 aggregate rice paddy output forecast - including the main 2013 season and the 2013/14 secondary season - to 18 million tonnes from previous estimates of a bumper crop of 18.9 million tonnes. "At the revised level, the 2013 paddy output would be slightly lower than that of 2012," it said. The final output will depend on timely rehabilitation and provision of seeds and fertilisers to allow farmers to replant before the end of the sowing period, the FAO said, calling for $24 million for immediate action targeting 250,000 households. Philippine authorities and international aid agencies face a mounting humanitarian crisis, with the number of people displaced by the catastrophe estimated at 4 million.